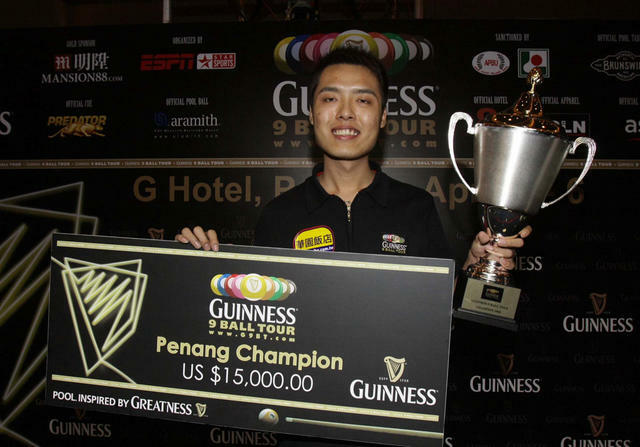 Taiwan's Jung-Lin Chang won his third title in a row by taking the Penang leg of the Guinness Asian 9-ball Tour. In the final he beat compatriot Hung-Hsiang Wang 11-7. The event was totally dominated by the Asian island nation. In the semifinals Chang defeated former world champion Chia-Ching Wu and Wang beat Chin-Shun Yang. Chang received $15,000 for the win. Wang got $6,000 for second place. The talented Chang is on a terrific run. He has now won three Tour events in a row and five of the last eight, including last year's Malaysia event. He of course heads the ranking list. Joven Bustamente (Philippines) and Yang shares second place. Wu and Wang lies in joint fourth. The competition was held April 4-6 at the G Hotel, Penang, Malaysia. The tour stays in Malaysia. Next stop is in Genting on 30 May - June 1. There are a total of six events in the Tour. The last is the Grand Final in Jakarta which is comprised of the top 10 in the overall Order of Merit.